It might seem like a far off notion to worry about heat stress while there is still snow on the ground in some areas but if you’re getting chicks for the first time try thinking beyond the cold weather and on to a warm sunny day and what to do and when. Preventing heat stress all together would be ideal. These are all great tips! I have a tip for you: DON’T OVER DO THE WATERMELON! This was learned the hard way, for us, the chickens have a difficult time eliminating waste, and some of the eggs we would crack, watery yolk would spray everywhere and have a bad smell! I freeze gallon jugs and water bottles (what ever I have empty) then I put them in a small garbage can with 2 inch holes cut around the bottom half, lay my box fan on top and its an air conditioner! At night I just put the jugs back in the freezer for the next day. For the most part, our chickens love them! 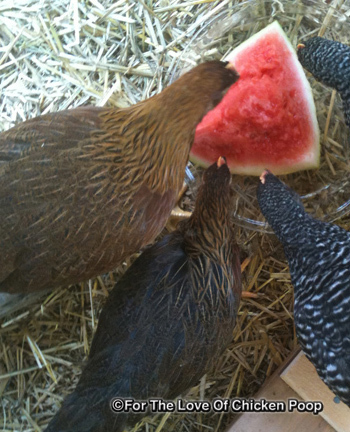 The Barred Rock teenagers near insanity when I take them their treats every hot afternoon. It is quite amusing. Ok, you want to hear HEAT, try 112 on July 4th, lost five of my 2year girls who were doing just great. Mister didn’t get turned on that day and I came home to a real disaster. Heart broken I diligently turn on the mister, wet down their yard, have big saucers and waterers everywhere, sort of too late but I will never make that mistake again, still chokes me up to think of my babies that aren’t here to run up to me. I did get nine new beauties a little older than what I started the other girls (one day old)I couldn’t stand it not to have chickens, I have learned a lot and even more with what I just read here tonight. Thank you so much for all you experienced info. I take fruits and veggies and put them in my food processor. Cucumbers, carrots, watermelon, apples, blueberries, strawberries,grapes, spinach,peas whatever is in season and I have an abundance of. Add a little water and 1/4 tsp of ACV if you want, it keeps the mix from turning brown. Pulse until it is a choppy, finely diced “soup”. Kind of like Gazpacho…yes, I have added tomatoes and fresh herbs also.I pour this into cool whip sized containers and freeze it. 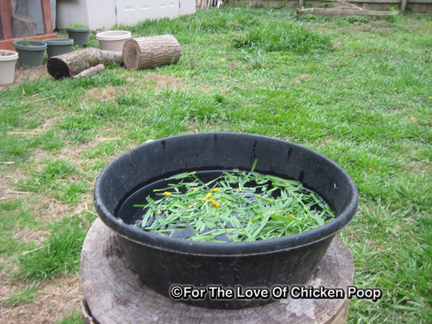 When the weather is hot, as usual here in NW Arkansas, I unmold it into shallow dog bowls I use just for them. It is put out under a cedar tree near the coop. When they see me coming they all run for the tree and relax and cool off while getting some nice cold fresh treats. They are all healthy and doing well. Even the turkeys love this treat. I also freeze 5 gallon buckets in my large upright freezer and put that into a large rubber bowl. 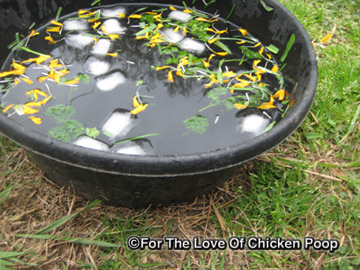 As the bucket “sweats” the chickens are drawn to the beads of water running down the side. They get a lot of cool water this way. I always love the tips and clue I get here. Thanks to all. I have 2 plastic waterers and put water in the top part and set in the freezer overnight. It gives them cool water for hours! Thanks for the added info! We built our coop to include good ventilation for heat and cold. Lower windows, upper windows in the raised coop, slanted roof etc. We have severe humidity and that makes it even worse – we have to balance everything out! This is from the American Pastured Poultry Producers Association – Go down to where it says Heart Attack and read what it says about apple cider vinegar – this web site has a lot of great information as well – good luck with your babies during the heat – our heat is already here as well, I am in the hill country of Texas (Mason, TX) and we hit 98 degrees yesterday. Thanks! I went to the link and it does give common sense info on ACV. Anyone interested in the uses of ACV for their chickens can check out the above link. Frozen corn on the cob or cut off? I’ve not tried it frozen with ours. They love corn in any form. Frozen corn on the cob might cause an all out chicken war in our run but other than that I don’t see any reason not to try. I read a few other sites that say using ACV in the water during times of heat increases the risk of acidosis. Is this true? I am NOT A VET OR PROFESSIONAL when it comes to keeping chickens. I have heard from both sides the pros and cons of ACV. I can only relay my experiences and what I’ve been told. Last fall (October) we were still having extremely hot weather and our chickens were (about four months old) and not taking the long drawn out heat spell well at all. I researched some ideas that people suggested – one being add ACV to their water help adjust the PH balance in their stressed systems. I also was very concerned about giving it to them. But I did give them one fourth cup of ACV to 3 gal. of water once a week for about three weeks. I knew this very small amount once a week would probably be more helpful than hurtful because of the fact that they were still growing like crazy. I honestly cannot say that it helped them but I can say it didn’t hurt them. I have not give them any since. It can but their systems out of balance or back in balance. I think it all depends on the age and overall health of the chickens. I will NOT use ACV on a regular basis as a preventative for heat stress. But I will have it on hand should one of them appear to be in trouble. I go with my gut instinct when it comes to my chickens health. If someone ever comes up with documented evidence on ACV uses it would be wonderful! I learned this many years ago when my children were in the 4 H rabbit club. Take an empty gallon milk jug, fill 3/4 full with water and freeze it. Put it in a shady spot and let the chickens gather aroung it. I tried this last summer when the temperatures soared to 100 degrees here in central PA. and it worked great!! I used 3 of the gallon jusg at a time for my 10 chhickens and they did very well during the heat wave. That is a great idea. We are already saving drink jugs for our triple digit weather! 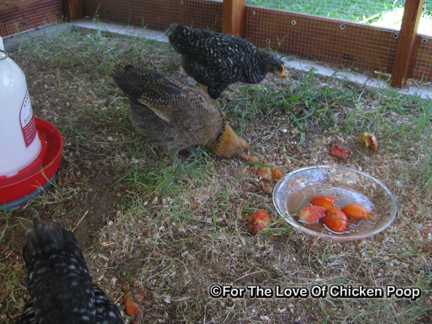 My chickens seem not to like people food very much…strawberries is all they’ll eat. I use vitamins w/ electrolytes in the water which I buy @ Tractor Supply. Also use organic apple cider vinegar. Had 91 yesterday and 74 today….Montana weather is crazy anymore!! Ours didn’t like people food for a long time, either! They finally figured out they were missing something. There is not much of our food they won’t eat now. We just make sure what they get is healthy! I walked out back with a Pop-sickle the other day and once they saw me I had to RUN back in, lol! You mentioned not feeding scatch in the hot months. What do you recommend feeding? The fans worked well for me last year. I lost no chicks to heat. My neighbor lost 3 before he listened to me and put a fan on them. 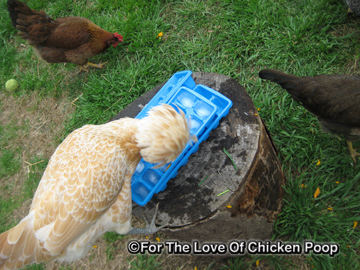 I also put a block of ice in their waterer to keep it cool. scratch should never be the main source of food, its more of a treat. 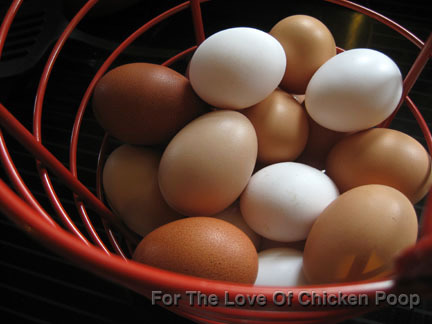 Layer food for hens is a balanced source of nutrition. Chicks have a different food, its higher in protein while they are growing. Our chickens have always gotten some type of ‘roost-time’ treat. They look forward to it and it give us a chance to make sure they’re settled in safe and happy. The kind of treats depend on the weather… In the warmer weather they get chopped up lettuce or a few grapes, small slices of cucumbers. A small amount of something light for their evening ritual! In the winter though they definitely get mash or cracked corn. Sorry! I meant scratch and cracked corn. Mash is a totally different type of feed. Thank You so much for putting this info on the site ! I am having problems now. In fact I posted my problem last night and ya’ll responded to me within 15 minutes. I followed your instructions and so far the chick is still alive and moving around some. I do believe I was keeping them to warm! Bless all of you that help us beginners. Hoping for the best for your chick! Raising chickens seems to be a never-ending education. Hatcheries often discuss “cold hardy” but almost never comment on how well a breed does in heat. Here in TX heat tolerance is much more critical than cold tolerance, even tho we do get some cold winter weather, too. Our heat is more severe & lasts longer. I freeze 2 liter soda bottles & use them with drip waterers, the chickens get very cold water as it thaws. Also, a fan in the runway area for air circulation is a must. I’ve been known to “float” a distressed hen in the horses’ water before setting her down in front of the fan. Considering they have to wear a down-filled-parka year round ‘heat hardy’ should be at the top of the list of considerations… One thing I want to get for ours this year is a kiddie pool. Maybe they’ll think they’re ducks for a while and swim in it to cool off. Or I can dunk them in it if need be! Sounds like you did a good job with them! I am new to raising chickens and my chicks are four to five weeks old. 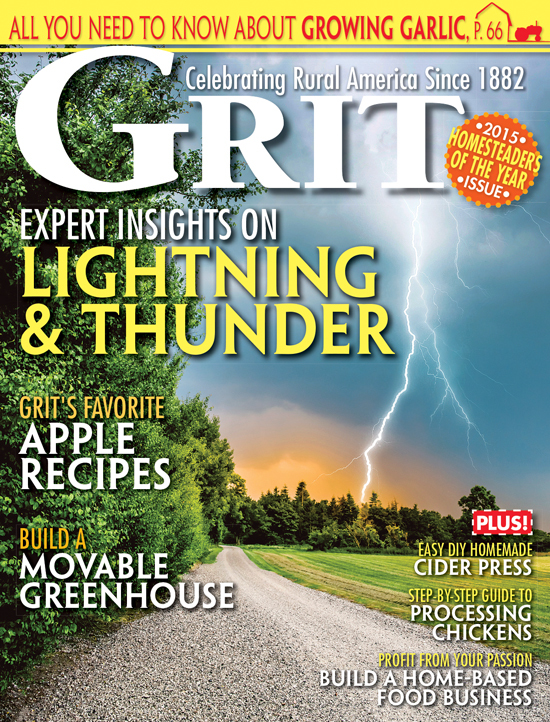 This is a very helpful article as we have already had very high temperatures. I love all the suggestions for treats. I can’t imagine why anyone would worry about pampering their animals, though (just ask my three cats). I had read about the electrolytes in general and bought a packet with vitamins at the feed store. Is there any reason I should have made them at home or should stop giving them the ones I bought? I am raising them organically. The electrolytes you purchased are fine, go ahead and use it up. Making your own is easy and less expensive than store-bought, and when you see heat stress you can provide it immediately without having to run to the store. Either way is ok. I use the homemade with good results, and it is HOT where I live (already over 100 degrees). Good luck!